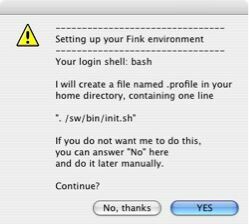 Before install Fink, you need X11 and the Apple Developer Tools (Xcode) installed. then double-click the package inside. At the end of the installation, the pathsetup utility will be launched. You will be asked for permission before your shell's configuration files are edited. When the utility has finished, you are set to go!